Buenos Aires (/ˌbweɪnəs ˈɛəriːz/ or /-ˈaɪrɪs/; Spanish pronunciation: [ˈbwenos ˈaiɾes]) is the capital and largest city of Argentina. The city is located on the western shore of the estuary of the Río de la Plata, on the South American continent's southeastern coast. 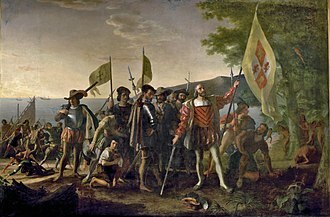 "Buenos Aires" can be translated as "fair winds" or "good airs", but the former was the meaning intended by the founders in the 16th century, by the use of the original name "Real de Nuestra Señora Santa María del Buen Ayre". 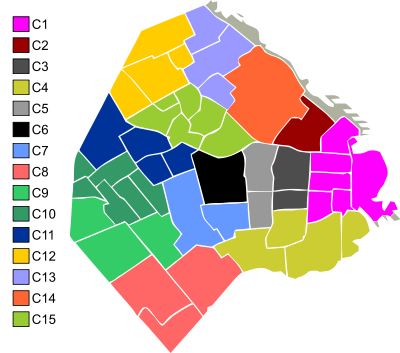 The Greater Buenos Aires conurbation, which also includes several Buenos Aires Province districts, constitutes the fourth-most populous metropolitan area in the Americas, with a population of around 14 million. 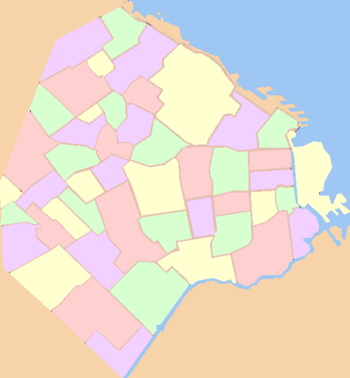 The city of Buenos Aires is neither part of Buenos Aires Province nor the Province's capital; rather, it is an autonomous district. In 1880, after decades of political infighting, Buenos Aires was federalized and removed from Buenos Aires Province. The city limits were enlarged to include the towns of Belgrano and Flores; both are now neighborhoods of the city. The 1994 constitutional amendment granted the city autonomy, hence its formal name: Autonomous City of Buenos Aires (Ciudad Autónoma de Buenos Aires; "CABA"). Its citizens first elected a chief of government (i.e. mayor) in 1996; previously, the mayor was directly appointed by the President of the Republic. Buenos Aires is considered an 'alpha city' by the study GaWC5. Buenos Aires' quality of life was ranked 91st in the world, being one of the best in Latin America in 2018. It is the most visited city in South America, and the second-most visited city of Latin America (behind Mexico City). Buenos Aires is a top tourist destination, and is known for its preserved Eclectic European architecture and rich cultural life. Buenos Aires held the 1st Pan American Games in 1951 as well as hosting two venues in the 1978 FIFA World Cup. Buenos Aires hosted the 2018 Summer Youth Olympics and the 2018 G20 summit. The Pirámide de Mayo (Spanish pronunciation: [piˈɾamiðe ðe ˈmaʝo], May Pyramid), located at the hub of the Plaza de Mayo, is the oldest national monument in the City of Buenos Aires. Its construction was ordered in 1811 by the Primera Junta to celebrate the first anniversary of the May Revolution. It was renovated in 1856, under the direction of Prilidiano Pueyrredón. In 1912, after having undergone many modifications, it was moved 63 metres (68.9 yards) to the east, with the idea that a much larger monument would eventually be constructed around it. The monument is crowned by an allegory of Liberty, the work of the French sculptor Joseph Dubourdieu. From the ground to the peak of the statue's Phrygian cap, the Pyramid measures 18.76 metres (61.5 feet). In 1906, with a few years until the centenary of the May Revolution, plans were put forward for the relocation to the center of the Plaza de Mayo. This was not realized until 1912. 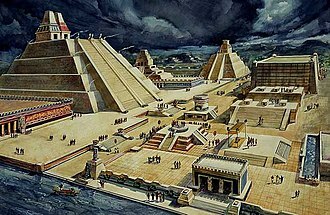 After the marble statues had been removed, the Pyramid was enclosed with wood for protection. Two rails were laid, four metres apart, supported by masonry pillars that could support a weight of 225 metric tons. 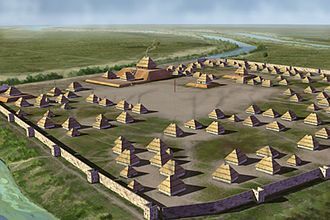 Under the Pyramid was a cement platform resting on solid wheels. Between the 12th and 20 November, the Pyramid was pulled 63.17 metres with a winch. A metal time capsule containing information about the relocation was buried under the Pyramid's new foundation. Jorge Luis Borges born in Buenos Aires in 1899. A fashion show at the Planetarium in 2013, as part of BAFWEEK. Homage to Buenos Aires, a mural located at the Carlos Gardel station of the Buenos Aires Underground. It represents a typical scene from the city and several of its icons, such as singer Carlos Gardel, the Obelisco, the port, tango dancing and the Abasto market. 200 Series rolling stock at San José de Flores station, Buenos Aires Underground. Women's Bridge was designed by Santiago Calatrava. Impression of the Buenos Aires Cathedral by Carlos Pellegrini, 1829. The Palace of the National Congress of Argentina. Monument to the Carta Magna and Four Regions of Argentina in the Palermo neighbourhood. Emeric Essex Vidal, General view of Buenos Ayres from the Plaza de Toros, 1820. In this area now lies the Plaza San Martín. View of Bolívar Street facing the Cabildo and Diagonal Norte, on Buenos Aires' historical center. The city's characteristic convergence of diverse architectural styles can be seen, including Spanish Colonial, Beaux-Arts and modernist architecture. El Ateneo Grand Splendid bookstore. Argentine Pavilion in Plaza San Martín (1889). Construction of the Obelisk of Buenos Aires on the 9 de Julio Avenue, 1936. Buenos Aires Museum of Modern Art. Colegio Nacional de Buenos Aires, a public high school in Buenos Aires, and it is one of the most prestigious in Argentina and Latin America. Heavy rain and lightning in Plaza San Martin. Storms are usual during the summer. The Catalinas Norte is an important business complex composed of nineteen commercial office buildings and occupied by numerous leading Argentine companies, foreign subsidiaries and diplomatic offices. It is located in the Retiro and San Nicolás neighborhoods. The Kirchner Cultural Centre is the largest of Latin America. Tango dancers during the World tango dance tournament. Gaumont Cinema inaugurated in 1912. Aerial view of the city skyline. 9 de Julio Avenue, 1986. Puerto Madero currently represents the largest urban renewal project in the city of Buenos Aires. Having undergone an impressive revival in merely a decade, it is one of the most successful recent waterfront renewal projects in the world. ... that during its operational history 1874–1926 the Argentine Corvette Uruguay (pictured) was a gunboat, school ship, expedition support ship, and Antarctic rescue vessel, and is now a museum ship in Buenos Aires? ... that the conspirators for the 1810 Argentine Independence movement's May Revolution had their secret gatherings at Hipólito Vieytes′s soap factory in Buenos Aires? ... that Argentine President Juan Perón took refuge in the Libertador Building in Buenos Aires before he was deposed and exiled in a coup d'état in 1955? Colegiales is a barrio or district in Buenos Aires, Argentina. It is located between Alvarez Thomas av., Forest av., De los Incas av., Virrey del Pino st., Cabildo av., Jorge Newbery st., Crámer st. and Dorrego av. This neighbourhood offers a vast amount of contrast and opportunities. There are large and tall buildings that go from the Crámer street to Avenida Cabildo and traditional houses up to three stories. This district has become a busy one with lots of pedestrians and cars that go about on the streets. 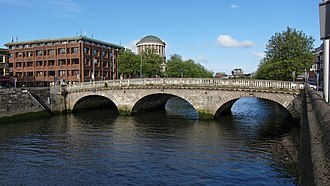 This neighbourhood is mainly residential, with some non-residential areas like the classification yard in the north-east zone, the fairs in the south-west (where until late 60's there was another classification yard) and the UCA grounds in south-east. The Colegiales Athletic and Social Club is probably the neighborhood's favorite social venue. Located on 2860 Teodoro García Street, it was famous in decades past for Roberto "Polaco" Goyeneche's frequent Tango recitals there. Colegiales was also home to the city's first cinema, "Las Familias." The cinema was probably better-known, however, for the people who had it built than for its distinction as a historical first. Though now a distant memory, the colorful Anselmis entertained generations of locals with their namesake circus on Lacroze and Cabildo Avenues. Sign up at Argentina WikiProject. WikiProject Argentina: Wikipedia's premier organization related to Argentina's articles and categories. Argentina-related regional notice board: If you create a new article related to Argentina, please list it here. Wikipedians in Argentina: A comprehensive list of Wikipedians from the country. Flores is a middle class barrio or district in the centre part of Buenos Aires city, Argentina. Flores was considered an area of the Province of Buenos Aires until 1888 when it was integrated into the City. The limits of the neighbourhood are marked by several streets and avenues, Cuenca, Flores was mainly composed of country houses from the wealthy people of the City of Buenos Aires. Today, remains of houses can still be found, including the house owned by Juan Manuel de Rosas. One of the most prominent of these early homeowners in Flores was the Marcó del Pont family, purchasing property facing the new railway station, they had a comfortable yet understated italianate property built in 1860. Relocating in 1929, the sold the property and the estate fell into disrepair. Slated at one time for demolition, it caught the attention of the San José de Flores Historical Society. Its fate now secure, as the home became the Marcó del Pont Cultural Center, a fictitious mythology of the neighborhood was created by author Alejandro Dolina, centered on the grey angel of Flores. The 1951 Pan American Games were held in Buenos Aires, Argentina between 25 February-9 March 1951. During the Pan American Exposition at Dallas in 1937, a sports program was staged. These included Athletics and Wrestling among others and this program was considered a success and a meeting of Olympic officials from the Americas was held. 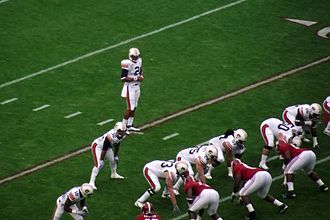 At the Pan American Sports Conference held in 1940, It was decided to hold the 1st Pan American Games at Buenos Aires, the Pan American Sports Committee was formed to govern the games. Avery Brundage, President of the USOC and Vice-President of the IOC, was elected as the first President, the Japanese attack on Pearl Harbor brought much of the Americas into World War II, thus forcing the cancellation of the 1942 games. A second conference was held in 1948, Avery Brundage was re-elected as the President of the PASC. It was decided that Buenos Aires would still host the 1st Pan American Games, the Greek athlete Aristeidis Roubanis lit the pebble for the first time. Liberty, in philosophy, involves free will as contrasted with determinism. In politics, liberty consists of the social and political freedoms to all community members are entitled. 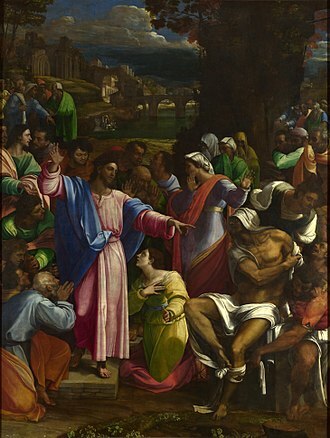 In theology, liberty is freedom from the effects of sin, spiritual servitude, as such, the exercise of liberty is subject to capability and limited by the rights of others. Philosophers from earliest times have considered the question of liberty, according to Thomas Hobbes, a free man is he that in those things which by his strength and wit he is able to do is not hindered to do what he hath the will to do. John Locke rejected that definition of liberty, while not specifically mentioning Hobbes, he attacks Sir Robert Filmer who had the same definition. According to Locke, In the state of nature, liberty consists of being free from any power on Earth. People are not under the will or lawmaking authority of others but have only the law of nature for their rule, in political society, liberty consists of being under no other lawmaking power except that established by consent in the commonwealth. People are free from the dominion of any will or legal restraint apart from that enacted by their own constituted lawmaking power according to the trust put in it. Thus, freedom is not as Sir Robert Filmer defines it, A liberty for everyone to do what he likes, to live as he pleases, freedom is constrained by laws in both the state of nature and political society. Freedom of nature is to be no other restraint but the law of nature. Freedom of people under government is to be under no restraint apart from standing rules to live by that are common to everyone in the society and made by the lawmaking power established in it. Persons have a right or liberty to follow their own will in all things that the law has not prohibited and not be subject to the inconstant, uncertain and arbitrary wills of others. John Stuart Mill, in his work, On Liberty, was the first to recognize the difference between liberty as the freedom to act and liberty as the absence of coercion, the modern concept of political liberty has its origins in the Greek concepts of freedom and slavery. 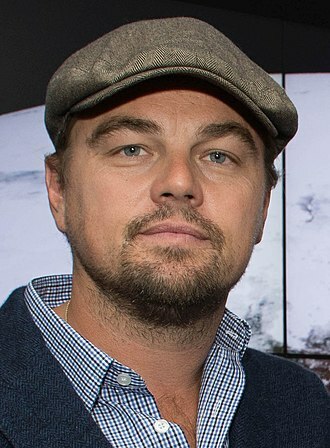 The President of the Argentine Nation, usually known as the President of Argentina, is both head of state and head of government of Argentina. Under the national Constitution, the President is the executive of the federal government. Through Argentine history, the office of the Head of State has undergone many changes, current President Mauricio Macri was sworn into office on 10 December 2015. The Constitution of Argentina, along with constitutional amendments, establishes the requirements and responsibilities of the president and term of office. The origins of Argentina as a nation can be traced to 1776, the Head of State continued to be the King, but he was represented locally by the Viceroy. These Viceroys were seldom natives of the country, by the May Revolution of May 25,1810, the first Argentine autonomous government, known as the Primera Junta, was formed in Buenos Aires. It was known as the Junta Grande when representatives from the provinces joined and this power was vested in one man when the position of Supreme Director was created by the 1813 National Assembly. The Supreme Directors became Heads of State after Independence was declared on 9 July 1816, in 1819, Congress declared Independence and composed a Constitution. This established a figure, named Supreme Director, who was vested with presidential powers. This constitution gave the Supreme Director the power of appointing Governors of the provinces, due to political circumstances, this constitution never came into force, and the central power was dissolved, leaving the country as a federation of provinces. A new constitution was drafted in 1826 and this constitution was the first to create a President, although this office retained the powers described in the 1819 constitution. This constitution did come into force, resulting in the election of the first President, because of the Cisplatine War, Rivadavia resigned after a short time, and the office was dissolved shortly after. A civil war between unitarios and federales ensued in the following decades, in this time, there was no central authority, and the closest to that was the Chairman of Foreign Relations, typically the Governor of the Province of Buenos Aires. Jacques de Liniers was a French officer in the Spanish military service, and a viceroy of the Spanish colonies of the Viceroyalty of the Río de la Plata. He is more known by the Spanish form of his name. Such a thing, the replacement of a viceroy without the Kings direct intervention, was completely unprecedented and he was confirmed in office by Charles IV of Spain, and endured a second ill-fated British Invasion attempt and a mutiny that sought to replace him. He was replaced in 1809 by Baltasar Hidalgo de Cisneros, appointed as viceroy by the Junta of Seville, when the May Revolution took place, Liniers decided to come out of his retirement and organized a monarchist uprising in Córdoba. However, Liniers was defeated and executed without trial, family Liniers is one of the most antique noble French family, known since the 11th century. One of its ancestors, Guillaume de Liniers died in the Battle of Poitiers, and eight of his members were Cavaliers of the Order of Saint John. In 1765, when he was 12 years old, as a son, he entered the military school at the Order of Malta. Then, he became Sub-Lieutenant of Cavalry in the Royal-Piémont Regiment in France, in 1774 he requested dismissal and re-enlisted as a volunteer in the campaigns against the Moors in Algiers. He benefited from the third Pacte de Famille, that allowed Frenchmen to take part in Spanish military campaigns with equal rights and requirements as the Spaniards, at the campaigns conclusion he took an exam as a Midshipman in Cádiz, to serve as a volunteer for the Spanish Crown. In 1775 he earned the rank of Ensign, in 1776, under the orders of Pedro de Cevallos, he sailed to the Viceroyalty of the Río de la Plata and took part on the occupation of Santa Catalina Island and the attack on Colonia del Sacramento. The American Revolution allowed him to stand out professionally, in 1780, with a few sloops, he captured a three-masted ship of 24 guns. This earned him promotion, to Frigate Captain, a few months Liniers took part in a new expedition, this time against the city of Algiers, during the First Barbary War and the Second Barbary War. The Primera Junta or First Assembly is the most common name given to the first independent government of Argentina. It was created on 25 May 1810, as a result of the events of the May Revolution, the Junta initially had representatives from only Buenos Aires. When it was expanded, as expected, with the addition of the representatives from the cities of the Viceroyalty of the Río de la Plata. The Junta operated at El Fuerte, which had used since 1776 as a residence by the Viceroys. Its claims had been rejected by Spanish Americans, and its authority was superseded by a Supreme Central Junta of Spain. When the Supreme Central Junta abolished itself in 1810, the politically active inhabitants of Buenos Aires saw no better moment than this to establish a local government, historically Buenos Aires province had partially mitigated this problem through contraband. The people were to assume the government until the King returned, the Viceroy and his supporters countered that the colonies belonged to Spain and did not have a political relationship with only the King. Therefore, they should follow any governmental body established in Spain as the authority, namely the Supreme Central Junta of Spain and its successor. 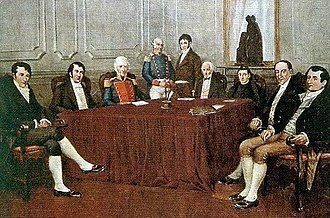 The meeting of a Buenos Aires cabildo abierto during 22 May 1810, came under pressure from the militias. The crowd favored the stance of the politicians, and the cabildo ended up creating the Primera Junta. Spain would never recover its dominion over that territory, the Audience refused at first to swear allegiance to the Junta, and when they finally did, prosecutor Caspe did so with clear gestures of contempt. Caspe would be ambushed near his home, in retaliation for this, the Cabildo imposed a time limit on the Junta, if the General Congress was not formed in six months, the Cabildo would reassume government. The Junta answered the day, rejecting such requirements. The Audience requested that the Junta submitted to the Regency Counsel, but the Junta refused, on the grounds that Cisneros did not so submit, the Audience itself swore allegiance to the Counsel shortly after, and they were all banished in response. It will be the first Summer Youth Olympic Games to be held outside Asia. Six bids were submitted for the 2018 Summer Youth Olympics. Buenos Aires confirmed their bid in September 2011, on 13 February 2013, the IOC selected Buenos Aires as one of the three Candidate Cities for the 2018 Summer Youth Olympic Games. The other two cities were Glasgow and Medellín. Guadalajara and Rotterdam failed to become candidates, poznań withdrew their bid before the candidate cities were selected. The host city election vote was held at an IOC Session in Lausanne, the first Coordination Commission meeting took place in Buenos Aires on 27–28 September 2014. The CEOs of Singapore 2010, Lillehammer 2016 and Innsbruck 2012 took part of meetings that were presided over by Frank Fredericks. In December 2015, the four-time olympic medalist Luciana Aymar was named as an ambassador of Buenos Aires 2018, FIFA has decided that futsal will replace football at the Buenos Aires Youth Olympics, while other sports such as skateboarding are being considered for the programme. On 17 March 2017, Roller speed skating was added to the Olympic programme, three years before the event, a survey showed that public support had reached 82.3 percent in favour of the Yourh Olympic games in Buenos Aires. The official emblem of the 2018 Summer Youth Olympics was presented in July 2015, each letter represents a famous landmark, including the Floralis Genérica, Space Tower, the Columbus Theatre, the National Library and the Obelisk. A short video produced by the Buenos Aires Youth Olympic Games Organising Committee shows what each letter on the emblem relates to. The original plan was based on the bid for the 2004 Summer Olympics, the Green Corridor and the Olympic Corridor shared River Plate Stadium, Tiro Federal, Gimnasia y Esgrima de Buenos Aires, Parque Tres de Febrero, La Bombonera, La Rural and CeNARD as venues. In order to group the sports in a compact framework, in September 2014 a new four-clusters concept was revealed. It was announced that each cluster will include an area called YOG FEST where sporting experiences, family entertainment and cultural activities will take place. Buenos Aires, city and vicinities, Landsat 8 satellite image. The Banda Oriental of the liberator José Gervasio Artigas defended the Federal system till all the provinces had equal conditions. Buenos Aires Governor Juan Manuel de Rosas secured the Confederation under Federalist rule. A Rosas-era banner calling for "death to the brutal Unitarians" typified the ongoing conflict. Clockwise from top: Chinese New Year celebrations in Chinatown, Barracas de Belgrano, a typical residential street in Belgrano "R" and River Plate Stadium. Washerwomen in Bajo Belgrano, painting by Prilidiano Pueyrredón, 1865. The Palermo Woods hosted the triathlon, beach volley and Cycling. Olympic Park for Buenos Aires 2018 seen from the Space Needle, May 2018. G20 family photo at the Teatro Colón in Buenos Aires. President Enrique Peña Nieto, President Donald Trump, and Prime Minister Justin Trudeau signed the USMCA agreement. Pirámide de Mayo, July 2005. The Open cabildo of 22 May decided to replace the viceroy with a Junta. 1897 lithograph of the members of the Primera Junta. Mariano Moreno, Secretary of War, was one of the most important members of the Primera Junta. Liberty Enlightening the World (known as the Statue of Liberty) was donated to the US by France in 1886 as an artistic personification of liberty. 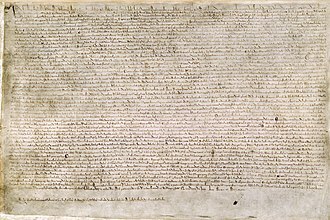 The Magna Carta (originally known as the Charter of Liberties) of 1215, written in iron gall ink on parchment in medieval Latin, using standard abbreviations of the period. This document is held at the British Library and is identified as "British Library Cotton MS Augustus II.106". Head of Attis wearing a Phrygian cap (Parian marble, 2nd century AD). In this 1793 British cartoon by James Gillray, who was deeply hostile to the French Revolution, a Phrygian cap substitutes for Scylla atop the dangerous "Rock of Democracy", as Britannia's boat (Constitution) navigates between Scylla's rock and Charybdis, the "Whirlpool of Arbitrary-Power", pursued by Scylla's "dogs": Sheridan, Fox, and Priestley, depicted as sharks. Governor Juan Manuel de Rosas (1841 oil portrait by Cayetano Descalzi) ruled until 1852 with an iron fist and kept the fragile Confederation under the tutelage of Buenos Aires Province. Period illustration of the 1882 placement of La Plata's foundation stone. Execution of Santiago de Liniers. Museum at the former house of Liniers, at Alta Gracia, Córdoba. 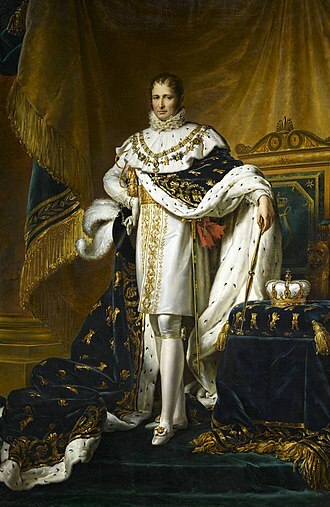 The rule of Joseph Bonaparte as King of Spain was resisted by Spaniards, and cast doubts on the legitimacy of the Spanish viceroys. 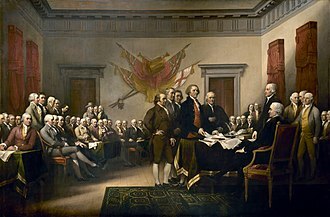 The US Declaration of Independence inspired similar movements in the Spanish colonies in South America. The coronation of Infanta Carlota Joaquina was considered an alternative to revolution. The Helium Centennial Time Columns Monument located in Amarillo, Texas holds 4 time capsules in stainless steel that should be opened after a duration of 25, 50, 100, and 1,000 years after they were locked in 1968. The Steinbach time capsule at the Shore Mall in southern New Jersey, installed in 1974. Herrick Tower time capsule, Adrian College, Michigan, 2009–2059. Combat of June 20: Barrancas Bridge's defence by the National Guard of Buenos Ayres. Battle of Los Corrales (June 21): Attack by national troops, near Corrales (Mataderos), defended by the National Guard of Buenos Ayres.